Attention car enthusiasts!!! This is the perfect home to combine your residential and business needs! 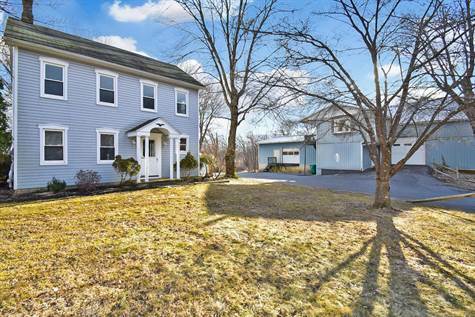 Sitting on 6.33 acres with two spring fed ponds, this beautifully remodeled 1900 farmhouse boasts an open concept floor plan and is located in the Nazareth School District! The Master Bedroom includes a private bath with a large walk-in shower. There is one additional bedroom on the 2nd floor and a third generous sized bedroom located on the third floor. First floor also boasts an office/den with loft that could be used as a fourth bedroom as well as a Sunroom overlooking the property. Approximately 10,000 sqft Morton Building and barn with loading dock, 7 garages and office space!! There is also an additional 1 car detached garage. This property is in a great location, private, but also close to major highways! !